As is typical of us, we’re never content to have just one of anything 🙂 If there are multiple brands of a particular liquor or liqueur, we like to try all of them to see what makes each one unique, and also figure out what recipes they work best in. 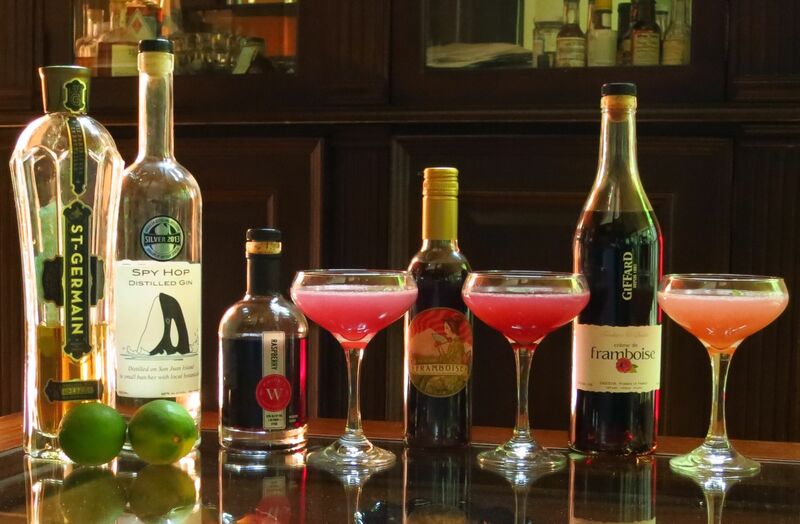 This week, we decided to taste the various raspberry liqueurs that we have in the liquor cabinet, and then try them in one of our original recipes to see how they compare. First up, we tasted each of the liqueurs on their own. Palate: Big hit of mildly acidic raspberry, then quite sweet and palate coating with dark corn syrup notes. Clean, light raspberry flavor compared to the others, not a lot of other notes. Least alcohol bite, medium sweetness compared to the other two. Palate: Tart raspberry to start, then grape brandy notes. Raspberry bramble on the aftertaste, which is sharp with touch of bitterness. Much more acidic than the other two. Raspberry flavor not terribly strong. Moderate alcohol, low sweetness compared to the other two. Palate: Very sweet with a strong alcohol burn. Sweet, strong, acidic raspberry on the intro. Cooked raspberry, waxy paraffin notes, slight menthol on the mid-palate. Little bit of pepper on the finish. Very viscous. Has more things going on than just the raspberry. High alcohol and sweetness compared to the other two. 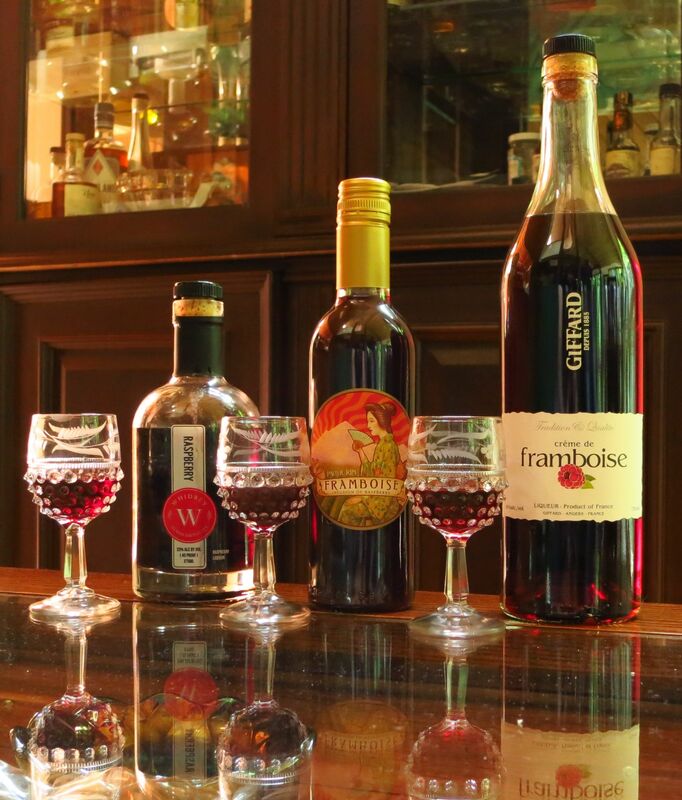 To showcase the liqueurs, we decided to see how each one did in a Fantod. This is an old recipe of ours that we’ve noodled with for several years to get to a good balance. It features raspberry, lime, and floral flavors. Palate: Raspberry and lime to start, leads into funky orris root, raspberry bramble and bay. Lime, rose, slight raspberry on the mid-palate. Bitter-sweet honey with some slight brine notes to finish. Christa gets slight yeasty sour notes (a bit like yogurt, weirdly enough) going into the mid-palate. Mildest raspberry flavor of the three. Interesting caraway notes as it warms up. Nose: Raspberry jam, lime peel. Gin botanicals more subdued. Palate: Concentrated cooked raspberry and some earthiness to start. Juniper from the gin clear on the mid-palate along with some honeycomb. Bitter lime peel, lime acid on the finish. Quite astringent. Stronger acid backbone throughout the whole drink. Lime peel and astringency really jump to the fore as it warms. Good raspberry flavor, though more fresh, tart, acidic raspberry than the others. Nose: Gin botanicals, especially juniper and bay, dusty, bramble-y raspberry, lime, slight menthol or mint. Palate: Very nicely integrated. Really nice round, sweet raspberry, lime and pomegranate on the intro. Honey at the end of the intro and into the mid-palate. Mid-palate is very perfume-y, with violet, orris root, lime zest, rose, but balanced really well by the sweet-sour notes of the drink overall. Has the strongest raspberry flavor, fairly sweet, not too astringent. As per usual, each liqueur has very different characteristics and which one you chose depends on what you’re looking for. The Giffard let the gin show through the most. It makes a nice complement with some mild raspberry notes but doesn’t take center stage. The Pacific Rim brings a lot of the acidic raspberry to the party, so if that’s what you’re looking for than this would be the one you want. It definitely makes a more astringent drink. Finally, the Whidbey was neither overpowering nor was it underrepresented in the drink, and it also brought more complexity and integrated best in the Fantod. It was Shaun’s favorite, while Christa wants to try a combination of the Pacific Rim and the Whidbey next time, as she likes a strong acid balance in her drinks. To each their own 🙂 As always, it’s really a matter of taste and depends on what you’re trying to achieve. This entry was posted in Cocktail Comparisons, gin, honey, raspberry liqueur, st. germain, Tasting Notes and tagged fantod cocktail recipe, giffard framboise, pacific rim framboise, spy hop gin, whidbey island raspberry liqueur. Bookmark the permalink.